I really don’t know what’s taken me soooo long to write about Quan Hapa! From amazing food to a uber-cool place to hang out (especially when the weather is warm), this place is a favorite of mine. As you can see from the top pic, the entire Vine Street side of the restaurant opens up creating an open-air dining experience for the entire restaurant. 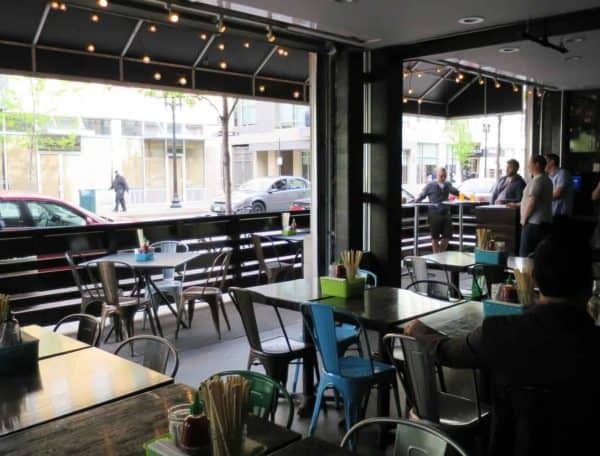 You can sit right along the sidewalk and people watch if you’re lucky enough to snag a table on the outer edge. 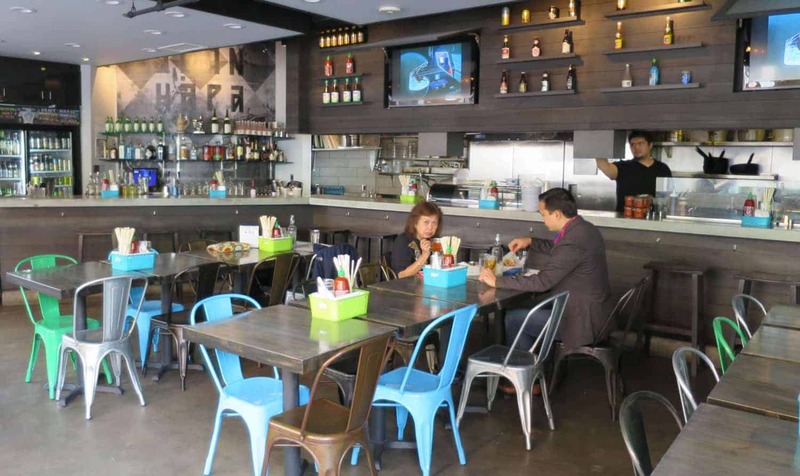 And on the opposite side (pictured above), they have an open kitchen and a full bar. And ignore the lack of people in my pictures. We like to go at “off times” so I can take pics without being annoying to the other people in the restaurant. While I love the atmosphere and that “open patio” feel, it’s the food that keeps me coming back. I had the House Okonomiyaki (pictured above). 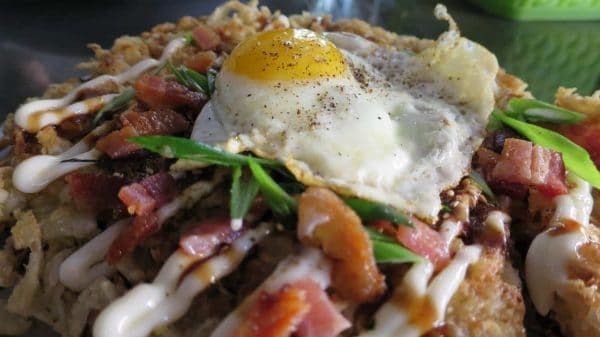 On the bottom is a Japanese pancake (made from shredded cabbage and a pancake-like batter) and it’s topped with japanese mayo, tonkatsu, bacon, green onion, and a fried egg. They have a few other variations on their menu and they frequently post “Okonomiyaki Specials” on their Facebook page so be sure to check them out there too. I think I could eat just about anything you put on a Japanese pancake! My better half had their DIY Salad Rolls. All the “fixins” come on a plate and you get a number of rice paper wrappers. The container you see on the left (picture above) has a water reservoir on one side. 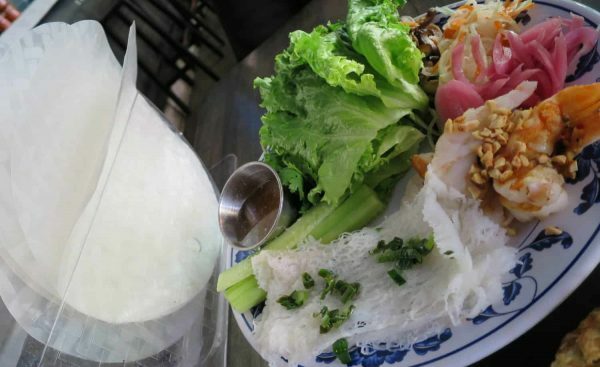 You take one of the rice paper wrappers and stick it in the water, rotating it until the entire thing is just wet. You’d be surprised how malleable that quick turn makes it. You then pick and choose from the ingredients (he chose shrimp and the rest includes pickled vegetables, lettuce, noodles, herbs, sauces) to wrap up a custom Salad Roll. He loved it. Quan Hapa also serves Ramen, Banh Mi, Short Ribs, wings, and more. You can order online and they offer delivery (within a radius and additional delivery fee may apply) via 53T Courier (Cincinnati’s bike courier service, specializing in food delivery). Check out their menu here. We “stumbled” upon Quan Hapa after the Opening Day parade. The Senate was closed, The Eagle had a 2 hour wait. We had a great, interesting meal. Staff was extremely helpful explaining the food choices. We will be back!